STUDENT SURVEYS indicate that the Circle -- the open area at the center of the Chalon Campus -- could be more user friendly. It's a lovely spot and the umbrella tables are often occupied, but on a sunny day the glare is pretty harsh, and it's often more of a pedestrian corridor than a spot to sit and enjoy. Starting today, the Circle is being transformed into a more inviting space of trees and a central fountain. It's an exciting project. Not only will it add beauty to this already marvelous campus, it will at last fulfill what turns out to be an 80-year-old vision. 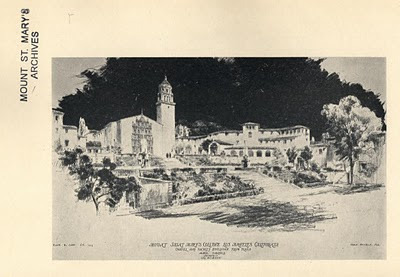 Mark Daniels, the original architect of the Chalon Campus, sketched his ideas in 1929, a partial set of which is held by the College Archives. But in some old newspaper clippings and the St. Mary's Academy 1930 annual, I came across a drawing I hadn't seen. This scanned image (click to enlarge) shows the expanse below a much more ornate Mary Chapel, with two fountains splashing away on either side. Daniels, who was also a landscape architect, knew that the timeless combination of water, gardens and dappled light was essential to inviting the College into the glorious climate he sought to showcase in his vision for the Mount.